Mechanical Engineering Research Fellow with the Centre for Compressor Technology receives recognition for an outstanding research paper. 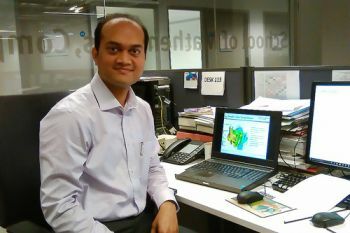 Dr Sham Rane, a Research Fellow in the Centre for Compressor Technology, has won the Institution of Mechanical Engineers (IMechE) Donald Julius Groen Prize 2015, for his paper titled, “Analytical Grid Generation for Accurate Representation of Clearances in CFD for Screw Machines”. The paper was presented at the 9th International Conference on Compressors and their Systems in September 2015. The high-profile Donald Julius Groen Prize is awarded by the IMechE’s Fluid Machinery Group to the authors of outstanding papers or for outstanding achievements in the Group’s sphere of activity. Fluid Mechanics is the branch of physics that studies the mechanics of fluids (liquids, gases, and plasmas) and the forces on them. Fluid mechanics has a wide range of applications, including for mechanical engineering, chemical engineering, geophysics, astrophysics, and biology.